Wall shelves are great for decorating, because they are so versatile. They come in many shapes, sizes and colors, from country-cute to modern and sleek, and can match any home's decorating theme. In addition, they can be used in a practical manner as storage, or they can be used to display a decorative item, such as a work of art. Determine your needs and your style. Do you need storage? Are you looking to display a valuable work of art? Is your home more modern or does it have a cottage feel? If your home is modern in design, you will want to stick to floating shelves that have minimal or no beveling on the edges. Otherwise, you can choose shelving units that have beveling. Go through your home and look for storage needs. 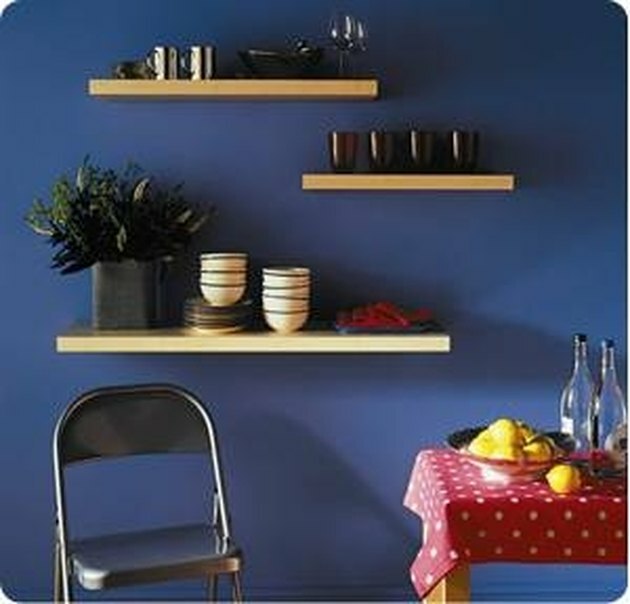 For example, shelves in the kitchen can be used to hold spices or canisters, or even used in place of cabinets. If you do not have enough cabinet space, hang three shelves of equal length above each other, and display your best dishes and glassware on them. Use shelving in place of furniture in small spaces. For example, hang a shelf in a small bathroom next to the sink, and place extra hand towels, soap, and a scented candle on it. Not only will it look nice, but it will provide a place to store the items that a guest might otherwise have to dig through a cupboard to find. Substitute shelves for items such as headboards or valances. A shelf placed above a window makes a great display unit for a child's trophies, and keeps them high enough so that her little brother can't touch them. A long shelf used in place of a headboard not only makes an interesting decorative statement, but is practical as well, because reading lights can be placed on them. If you have a small bedroom, you can even use shelves in place of end tables on either side of your bed. Make a bold statement with wall shelves. Instead of a bookshelf in your family room, hang five or six three-foot-long floating shelves from the floor to the ceiling, and fill them with family photos, DVDs and other decorative items. Alternatively, run a shelf the entire length of one side of your dining room, and display your collection of antique plates on it.